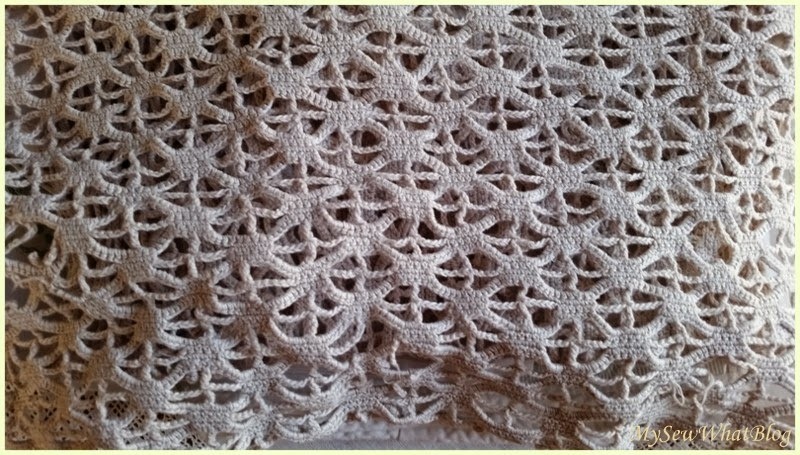 It's All About that Lace.....and the Linens! Over the weekend we drove out of town to a well-known chocolate shop to purchase Easter gifts. While we were there, I sat down to drink a cup of chai tea latte and my husband enjoyed a cup of herbal tea, We made our purchase, drank our teas and left to head back into town. I wasn't quite ready to head home so my husband suggested we stop at an antique shop before going home! Am I ever glad we did! 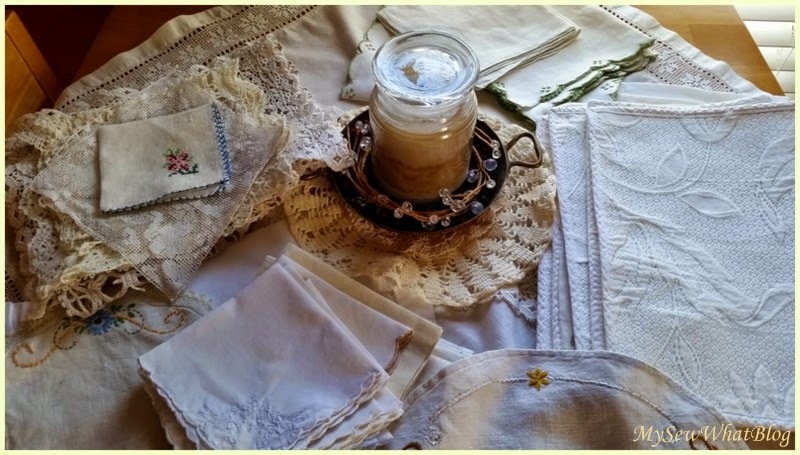 My kitchen table looked like this after I got home with some vintage linens that I scooped up for a song. 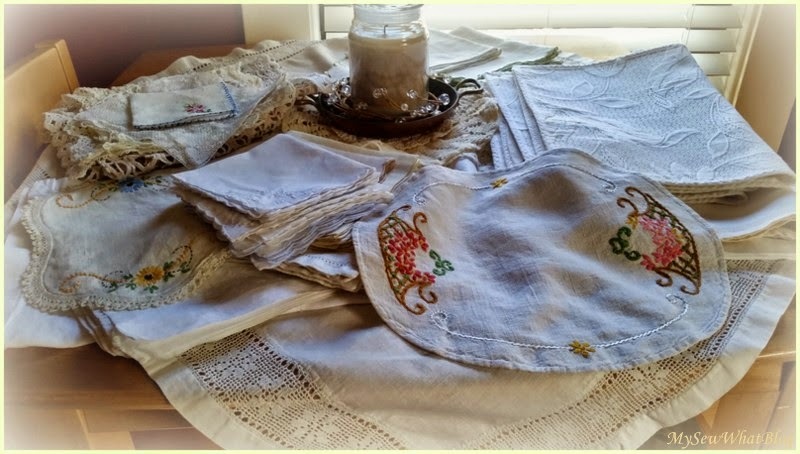 In the shop were baskets of linens, doilies, etc that were packaged in zip lock bags. Many bags contained 5-6 pieces and they were marked $1.00. You should have seem me with my arms full of plastic bags. They were slippery, I kept dropping one after another but it didn't matter because I was in hog heaven! I washed them, ironed them and folded them neatly. 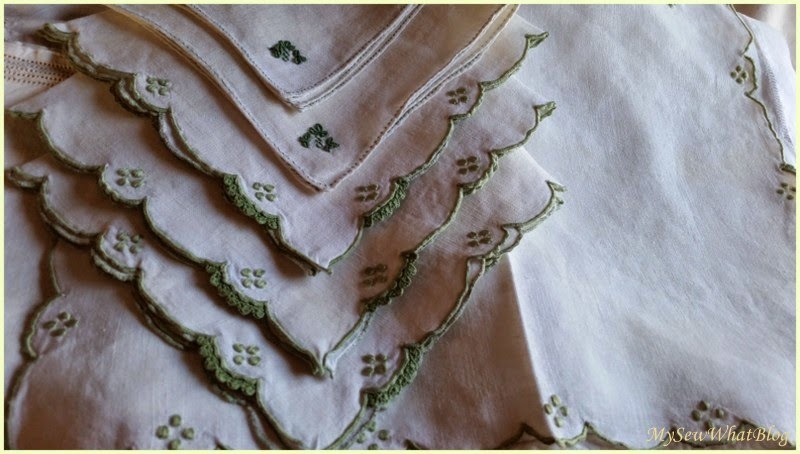 Then I just admired them.The tablecloth covering my kitchen table was also one of my purchases. I fell in love with it and it was in pristine condition! 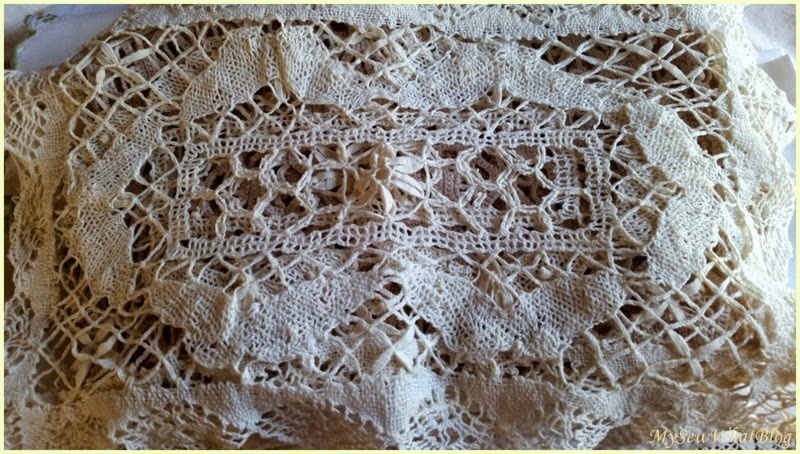 Look at the lovely inset lace. It is a beautiful shade of ecru. 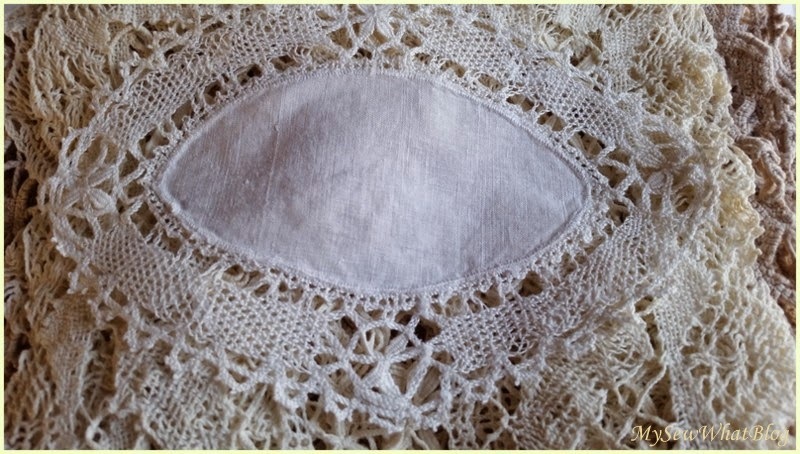 Sweetest little linen and lace doily. ....and here. Got my brain gears a cranking and spinning. 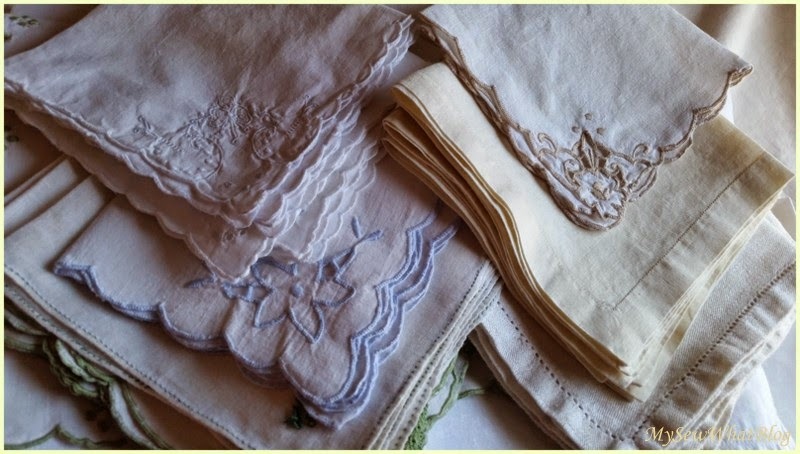 There were many varieties of cocktail, luncheon and dinner napkins....all in excellent condition. 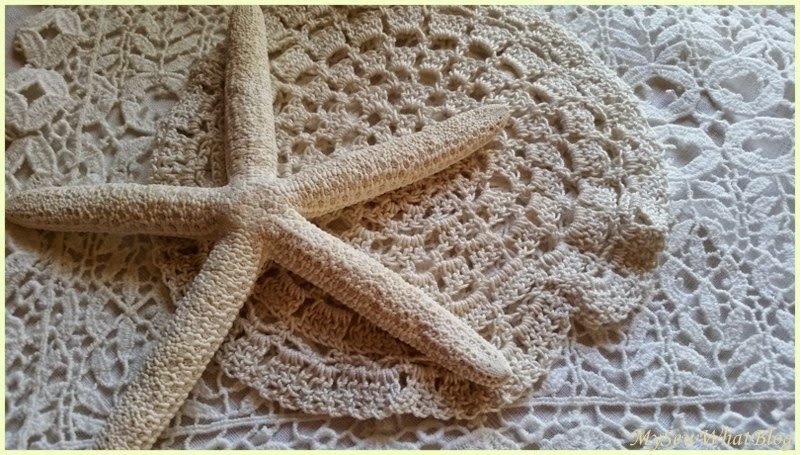 Here are some sweet doilies....theses were in a baggie with several other items for $1.00. 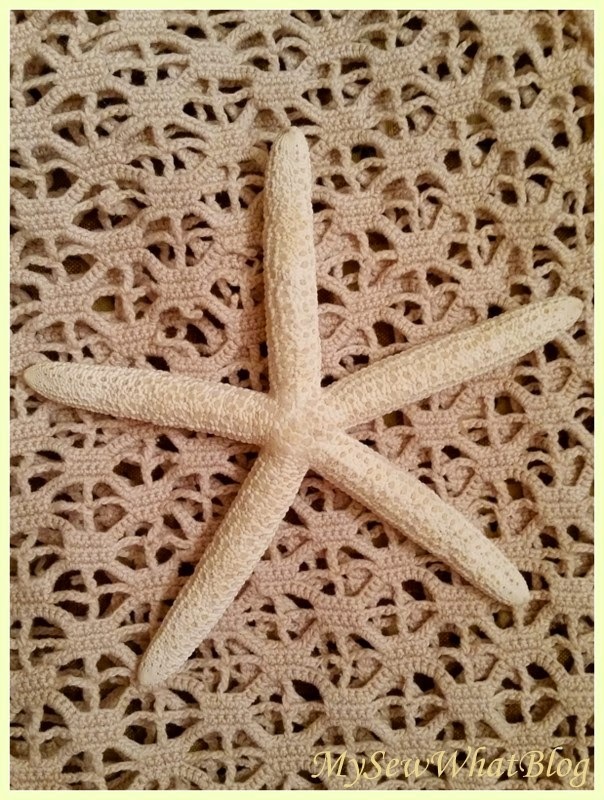 These are placemat sized and they are very pretty! These are quite pretty too! This was one of my favorites! 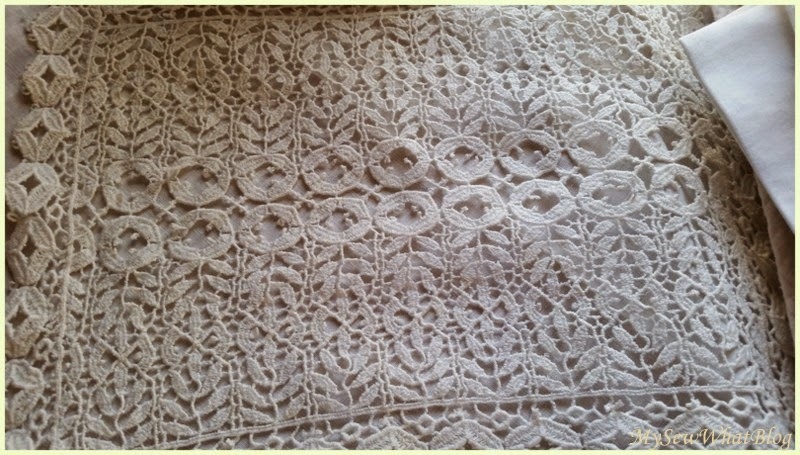 Another tablecloth. 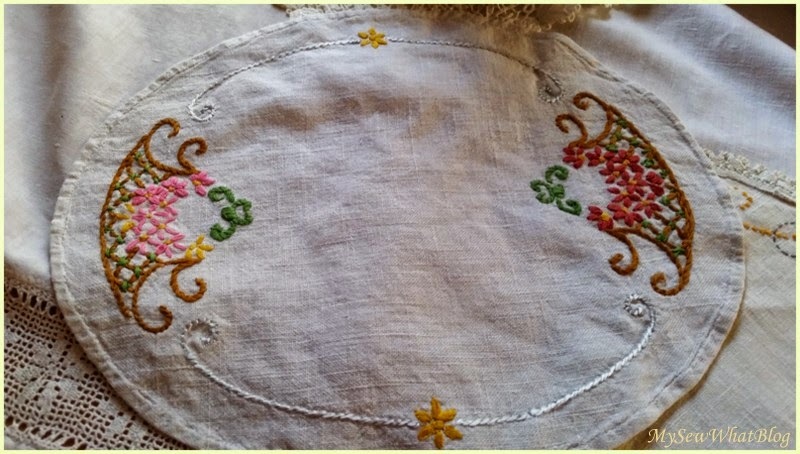 The linen was of such beautiful quality. That one's a keeper too! 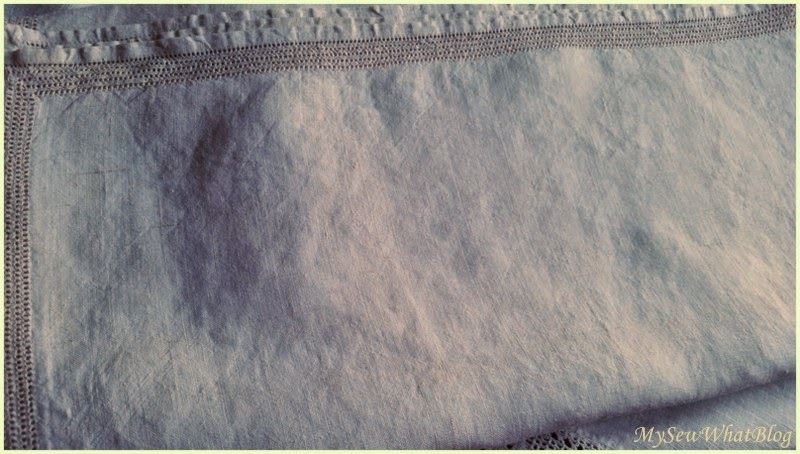 ...and the reason I posted this photo at the beginning of the post is because I used some linens to create just a pretty sewing spot. 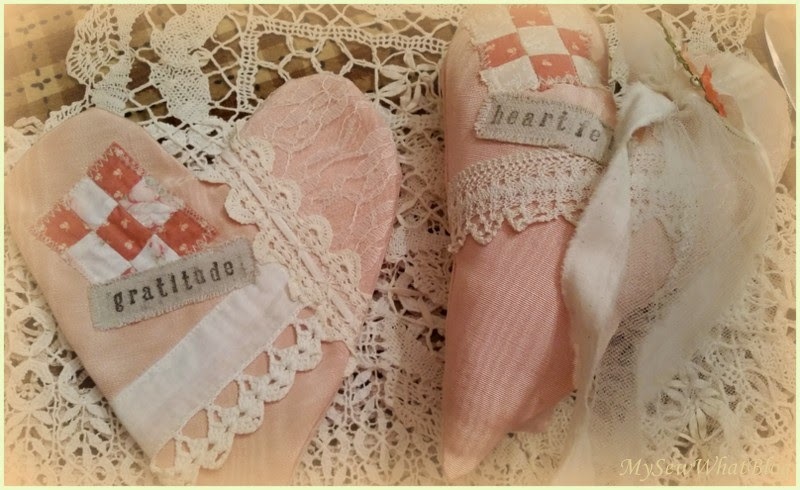 I sewed yesterday trying to complete some heart pillows for my etsy shop. 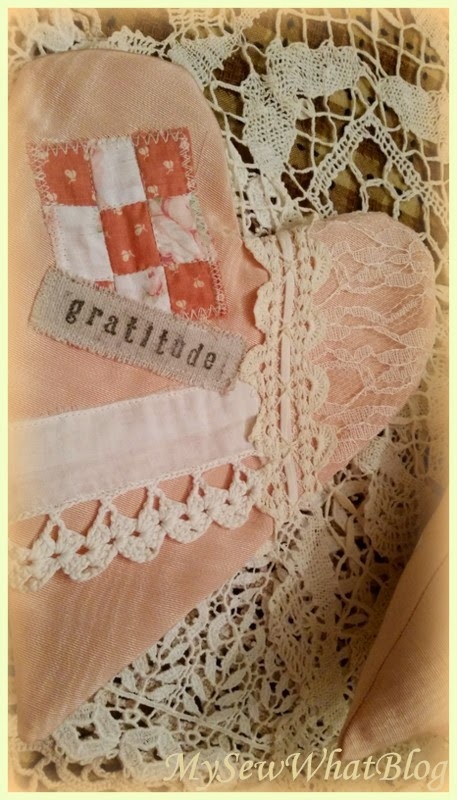 The sweet little pincushion was given to me by Debbie who blogs over at She Graces Her Home in God's Beauty. It is darling and it has really come in very handy. The one on the left is not stuffed yet, obviously! 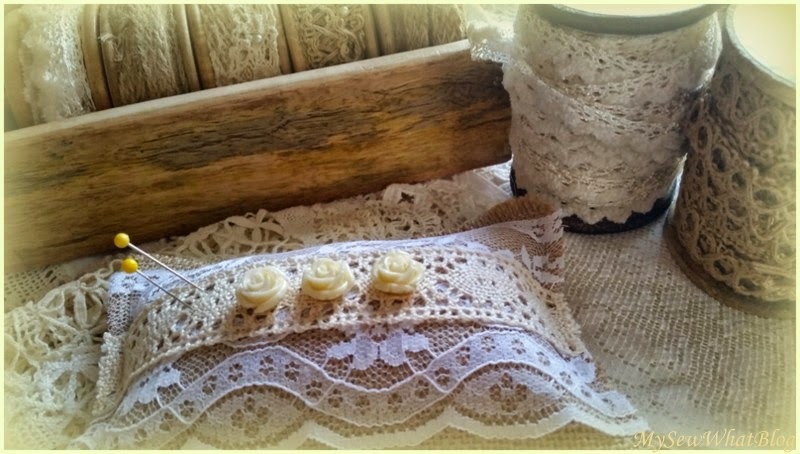 They too look nice paired with lace or linens! All in all, a very nice Sunday afternoon! I was pleased with my purchases! So pleased in fact, that I went back today and got another whole stack. But that's another post. It's late and I have to work tomorrow so good night, sleep tight and don't let the bed bugs bite!